Alcatraz Island is located in the San Francisco Bay, 1.5 miles (2.4 km) offshore from San Francisco, California, United States. Often referred to as “The Rock”, the small island was developed with facilities for a lighthouse, a military fortification, a military prison (1868), and a federal prison from 1933 until 1963. Beginning in November 1969, the island was occupied for more than 19 months by a group of Aboriginal peoples from San Francisco who were part of a wave of Native activism across the nation with public protests through the 1970s. In 1972, Alcatraz became a national recreation area and received designation as a National Historic Landmark in 1986. Today, the island’s facilities are managed by the National Park Service as part of the Golden Gate National Recreation Area; it is open to tours. Visitors can reach the island by ferry ride from Pier 33, near Fisherman’s Wharf, San Francisco. Hornblower Cruises and Events, operating under the name Alcatraz Cruises, is the official ferry provider to and from the island. Hornblower launched the nation’s first hybrid propulsion ferry in 2008, the Hornblower Hybrid, which now serves the island, docking at the Alcatraz Wharf. It is home to the abandoned prison, the site of the oldest operating lighthouse on the West Coast of the United States, early military fortifications, and natural features such as rock pools and a seabird colony (mostly Western Gulls, cormorants, and egrets). According to a 1971 documentary on the History of Alcatraz, the island measures 1,675 feet (511 m) by 590 feet (180 m) and is 135 feet (41 m) at highest point during mean tide. However, the total area of the island is reported to be 22 acres (8.9 ha). Mount Tamalpais (/tæməlˈpaɪ.ɨs/; known locally as Mount Tam) is a peak in Marin County, California, United States, often considered symbolic of Marin County. Much of Mount Tamalpais is protected within public lands such as Mount Tamalpais State Park and the Mount Tamalpais Watershed. Location Marin County, California, U.S.
Mount Tamalpais is the highest peak in the Marin Hills, which are part of the Northern California Coast Ranges. The elevation at the East Peak, its highest point, is 2,574 feet (785 m). The West Peak, the mountain’s second highest peak, where a radar dome currently stands, is at about 2,563 feet (781 m). It stood over 2,600 feet (792 m) before the summit was flattened for the radar dome construction. 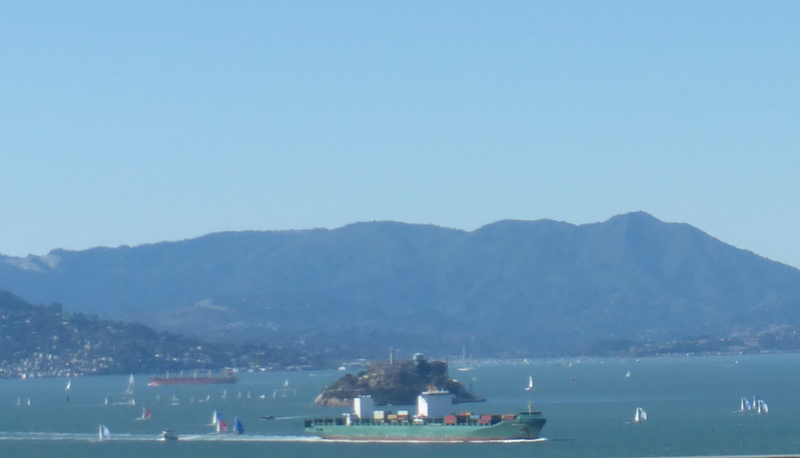 The mountain is clearly visible from the city of San Francisco and the East Bay region. The majority of the mountain is contained in protected public lands, including Mount Tamalpais State Park, Muir Woods National Monument, and the Mount Tamalpais Watershed. It adjoins the Golden Gate National Recreation Area (which in turn adjoins Point Reyes National Seashore) as well as several Marin County Open Space Preserves. This provides nearly 40 miles (64 km) of continuous publicly accessible open space. Some of the lower slopes of Mount Tamalpais fall within several cities and unincorporated communities of Marin County, including Mill Valley, Tamalpais-Homestead Valley, Stinson Beach, and Kentfield. These areas are generally developed, consisting of mostly low-density single-family homes.